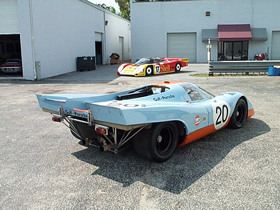 This 917, chassis # 022, was purchased in 1970, from the Porsche factory, by Solar Productions. This is the movie production company that was owned by Steve McQueen. It was also the company that would bring the movie "Le Mans" to the big screen. This is the car that McQueens character, Michael Delaney, starts the race in, and "crashes" late in the race, "writing the car off." The car that was crashed was really a Lola T-70, painted and rebodied, to look like a 917 (the T-70 was a cheaper alternative to write off, than the 917). Many innovations in cinematography, were first tried in this movie. They even went so far, as to weld brackets to the front frame work of the 917, so they could mount a camera to shoot Steve, and the other drivers, in the cockpit. The brackets are still on this car. After the movie was finished, the car was raced a few times, and then sold to Brian Redman. Brian sold the car, in 1975, to friend, and Le Mans winning 917 driver Richard Attwood. Richard ran the car sporadically, in European historic racing events, painted up like the 1970 Salzburg 917K, which is the car he drove, with Hans Hermann, to give Porsche its first overall victory, at the Le Mans 24 hour race. Richard finally decided to sell the car, in 1999, at the RM auction in Monterey. Before putting the car up for auction, he repainted it, to the colors that it was most famous for wearing, even, if only in a movie. The car was purchased by longtime Porsche collector Frank Gallogly. It has joined us, at Gunnar Racing, in our museum, next to Franks other 917, the Martini and Rossi car that won Sebring in 1971, with Vic Elford driving. It is a real treat to see the car that so many of us have watched in that infamous movie. You can almost picture Steve McQueen, as Michael Delaney, in the cockpit. Here is the view of the car from straight on. This is probably the most traceable history 917 there is, having only been owned by 3 people, before Frank Gallogly bought it, last August. 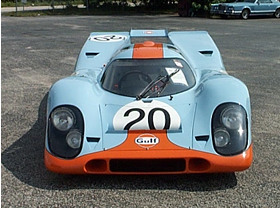 In this photo, you can see how none of the things that distinguish a Gulf 917, including the side marker light, or rear electrical "cutoff" switch are evident. The car was painted in this livery for the movie "Le Mans," and was never raced in Gulf Oil colors. You can see the rear center wing has been added to the tail of this 917K. There were many different tail configurations on the 917K, depending on where they were racing. This was to help with more rear down force. 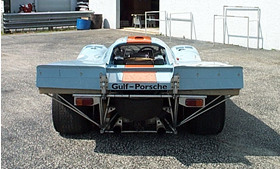 With this view, you will notice that the rear fenders weren't flared nearly as much as those on many of the other 917s. This is probably due to the fact that this car saw limited racing activity. This car is very near the configuration that it would have left the factory, in 1970. 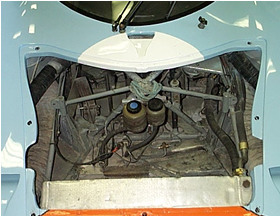 This is a view inside the front footwell area. The camera mounts are still visible from 1970. This is where a a framework was built, for the camera, that would shoot the drivers, while driving the 917 on the track. A real piece of movie and racing history, right there.